The all-round skills of Samit Patel and captain Dan Christian helped Notts Outlaws secure a place at this year’s NatWest T20 Blast Finals Day. Both players followed up disciplined spells with the ball by adding crucial runs as Notts chased down a victory target of 152 to defeat Somerset by five wickets, in their quarter-final clash at Trent Bridge. Patel scored 45 from 28 deliveries and Christian was unbeaten at the end on 36. Asked to bat first, the visitors scored 151 for six, with Steven Davies top-scoring with 59, making his runs from 41 balls, having hit five fours and three sixes. Jake Ball, two for 21, was the pick of the home attack, with Patel and Christian also claiming two wickets apiece. Cheered on by the majority of the 12,171 crowd, Notts reached their target with nine balls remaining as Steven Mullaney, 20 not out, hit the winning boundary. At the start of the evening, Lewis Gregory, skippering Somerset for the first time in T20 cricket after Jim Allenby pulled out with a hand injury, opened the batting but swished all around a straight delivery from Ball and was bowled for three. Ball removed Johann Myburgh first up, feathering behind, and the bowler’s double-wicket maiden ended with him throwing the stumps down as Trego, on 15, scrambled back to make his ground. Trego made 40, sharing in a third wicket stand of 85 in 9.3 overs but was despatched thanks to a diving boundary catch by Ball, from Christian’s bowling. For the second time in the innings a wicket fell to the subsequent delivery, with James Hildreth chipping straight back to bowler Patel. Davies should have been run out on 54 but, having slipped, he was able to make his ground after Harry Gurney threw to the wrong end. The lapse wasn’t costly as Davies found the safe hands of Alex Hales in the next over and then Patel removed Michael Leask, leaving the visitors some way short of this season’s Trent Bridge average score. Riki Wessels fell in the first over of the chase, hitting Max Waller’s leg spin to deep midwicket. Third umpire Graham Lloyd alienated most of the home supporters when he gave Hales out in the fourth over. The England international had drilled Gregory’s second delivery to Trego at mid off. Replays on the large screens seemed to suggest that the batsman may have been unlucky but Hales was sent on his way, regardless. Tom Moores fell to Craig Overton and Brendan Taylor was run out for 20, leaving Notts still requiring 83 from the final 10 overs. Patel propelled Notts towards the finishing line in making 45 from 28 balls but was then run out by the boot of bowler Gregory. Nineteen runs came from the eighteenth over, bowled by Overton, leaving Mullaney to bask in the glory of launching the winning hit over wide long-on. 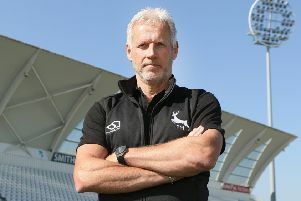 The result means that the Nottinghamshire club remain on course for a domestic treble, having already lifted the Royal London One-Day Cup and built a substantial lead at the top of the Second Division of the Specsavers County Championship. They have never lifted the domestic T20 title, though, and will be joined at Edgbaston by Hampshire, Leicestershire and the winners of Friday’s final quarter-final between Surrey and Birmingham Bears.